Beautiful sunshine this week, good job we didn’t play xmas day with the torrential rain! Only 24 players so 2 prizes in 1st and 2nd divisions. Next week is the 1st Apollo Air stableford of the year. As there is not much to report this week here is a list of all the winners during the year – make your own mind up who the bandits are! Wishing all our members a happy, prosperous and healthy new year. Well, the festive season is here and on behalf of the committee I would like to wish all our members a merry Christmas and a happy and prosperous new year. players in the party spirit…….. 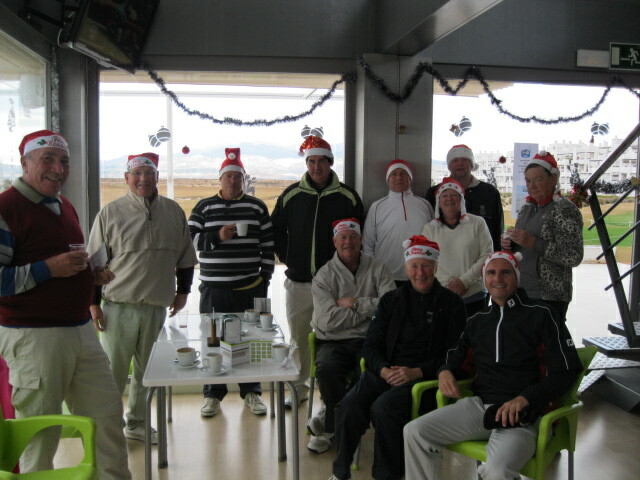 This week was the ‘white xmas’ stableford, with gents testing themselves off the white tees and the ladies off the blues. I think the results showed that we are not ready to turn pro yet with only 3 players reaching 30pts and the winner below 36pts. 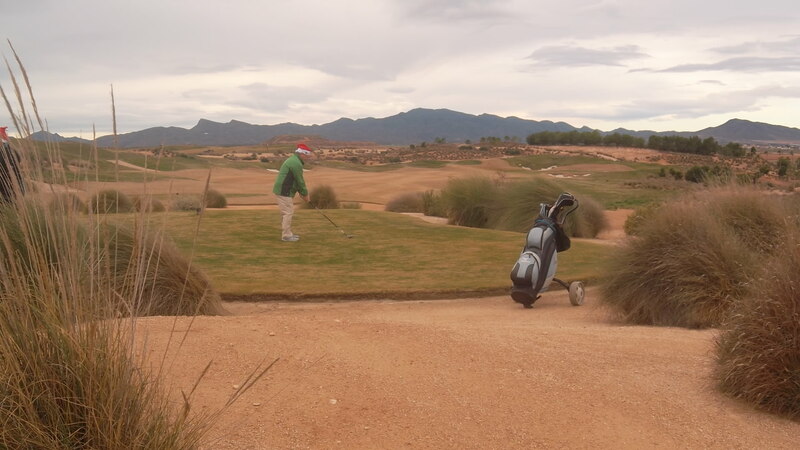 Kev soon found out how difficult it would be when his drive from the 1st finished unplayable short of the yellow markers, and he had to take his optional ‘throw’ to get his ball onto the yellows! It was a freezing cold day with the threatening clouds delivering an unwelcome shower for a few holes, and this sent some of the players scurrying for shelter in the clubhouse. only 24 set off, and fewer finished! No handicap adjustments this week when a throw was allowed to the shout of ‘I believe in Rudolf’. 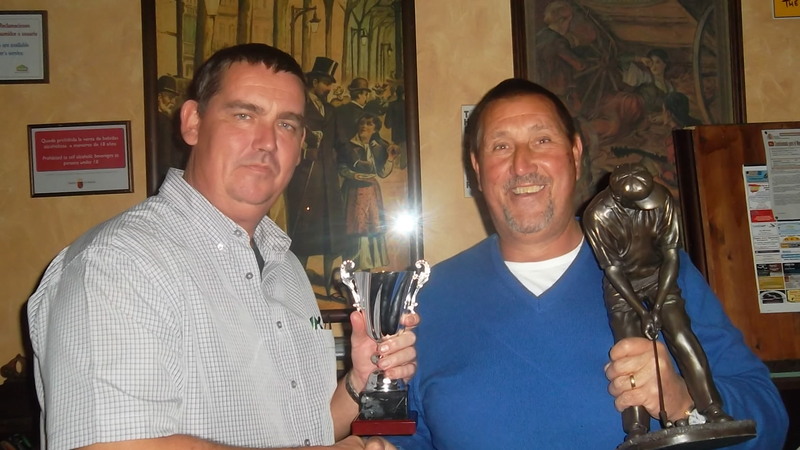 The presentation was put back to 7pm with a buffet being provide by Neil who also gave the trophy and replica. Entertainment followed with excellent live music from the Cas band. 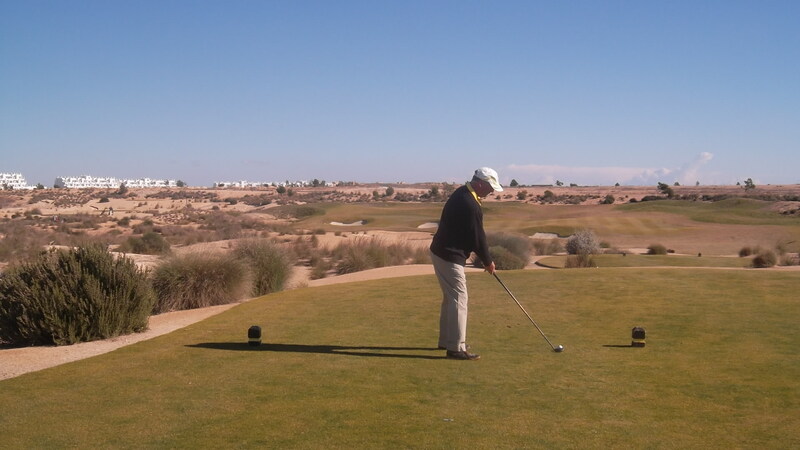 Les starts off his winning round……..
Eamon Barry just manages to keep his balance in the strong wind………. Notice the new purple society shirt for 2014 in the corner? These are available from Kev for only €15. Next week there will be a pairs betterball competition. As Wednesday is xmas day there will be no roll up meeting in the Clover, so just go to the clubhouse and put your name on the start sheet. Another disappointing outcome of the offer to allow members to play free during December and January is that not only can they not ring up on the day for a time, if they turn up they can’t book a time for later. They must wait unti the 1st available time and if no-one else has booked it, then they can play for nothing. Talk about jumping through hoops? I don’t think all this was made clear when the offer was made. The original message from IRM quite clearly stated “ if a member was to call one of the shops in the morning to make a booking they could then play without paying the GF the same day”. At this year’s AGM the role of social secretary will become vacant – Cath Emmett-Smith will not be continuing in the position she has filled so well over the last 3 years. She has done a marvellous job in a role which is both time consuming and demanding, and is leaving the social side of the society in a strong financial position. She has organised about 8 functions a year to enhance the major competition presentations, and this has always been done to give our members the best possible catering and entertainment at a variety of venues at the least possible price. She has also arranged transport for all the off site venues. We all appreciate the work she has done and the time she has put in. Thanks for everything Cath! We would hope that someone would make themselves available to continue the work Cath has done and the committee will give them all the support possible. Below is a job description of the position. Please contact a committee member if you are interested. 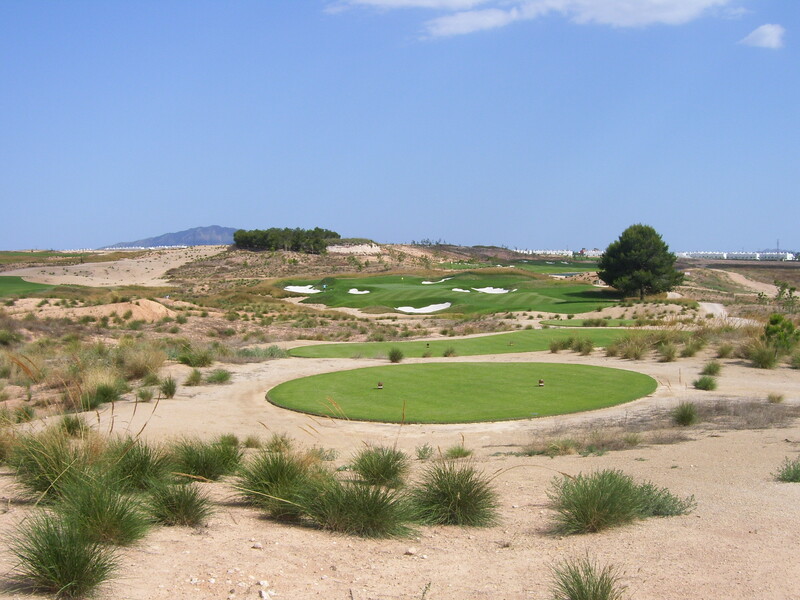 Condado de Alhama Golf Society Committee: Position of Social Secretary. Source and evaluate possible venues, food and entertainment. Produce, and sell tickets for each event. Organise and manage the actual events. Actively seek sponsorship for the society. Be available and willing to answer any questions posed by members. Actively seek to develop the society (in line with the constitution) for the benefit of its members (not for personal gain). Promote the society in a positive light at all times. A couple of offers which our members may be interested in. IRM are giving twilight rate all day on Condado Thursday, Saturday and Sunday (€34 for residents). 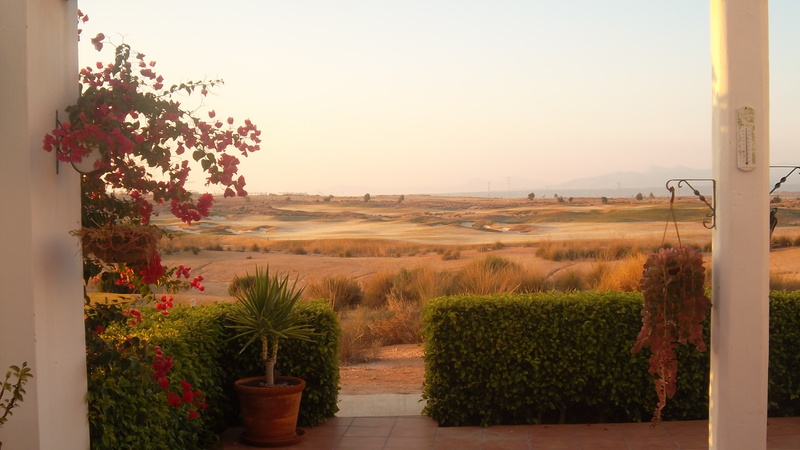 No offer at Mar Menor, but offers at other courses. No information is available about those and it is not on their website. 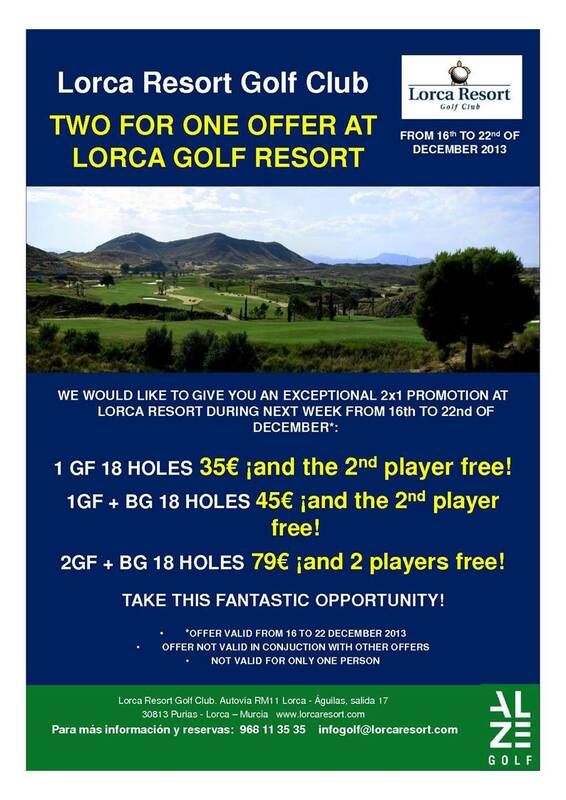 Also Lorca Golf Resort invites you to play golf with this fantastic 2×1 offer during next week. Perfect conditions for golf with no wind and warm enough for short sleeves. Only 30 players though, of which only 2 managed to beat par. After a long struggle with my irons throughout the summer at last my game returned and was good enough to come out on top. So Friday the 13th wasn’t too unlucky for me! 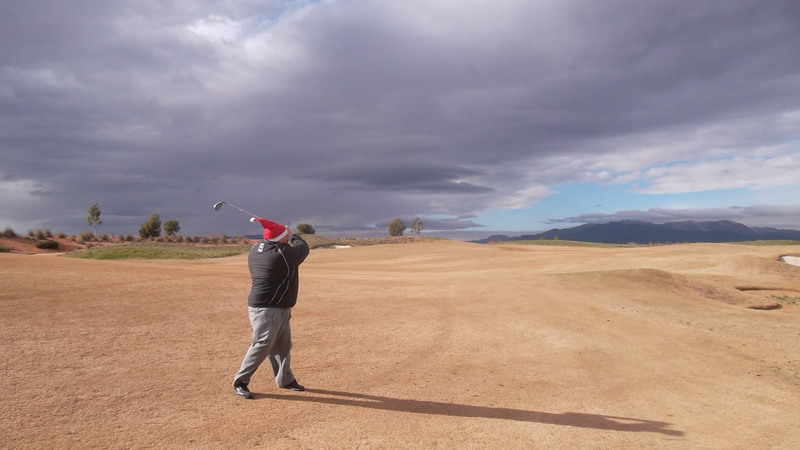 Vice captain Dave Rollett teeing off at hole 7……..
Next week is the ‘White Christmas’ competition where just for a change the men will play from the white tees and the ladies from the blue tees. This will mean however, that all players will receive a higher slope allowance to compensate for the extra distance. It should be interesting with the course seeming completely different. Neil and Lynn are providing mulled wine and mince pies on the 1st tee. All players should wear a santa hat and bring a wrapped bottle to the presentation. Everyone will get a prize, and the winner will receive a trophy. 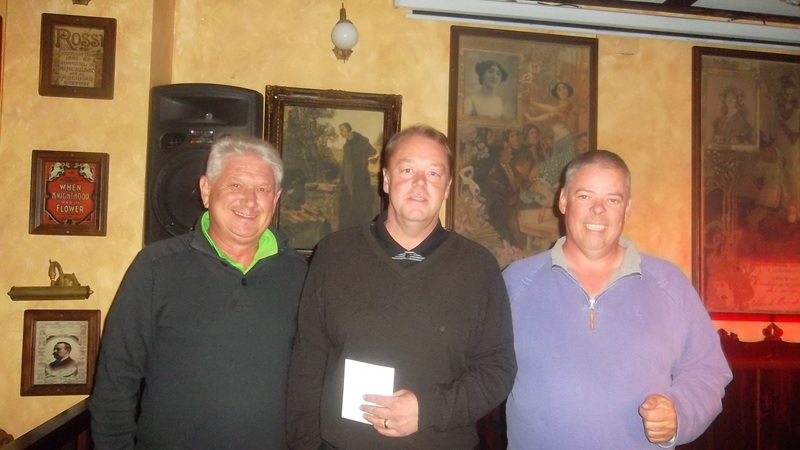 A couple of weeks ago one of our members (Paddy McKee) returned home to Ireland after a few weeks of golfing with the society, only to suffer a heart attack. Fortunately Paddy was treated promptly and after receiving angioplasty is now home and recovering well. All the members wish Paddy a speedy recovery and look forward to having him back with us in the new year. It is not long now to 2014, and the first major of the year. 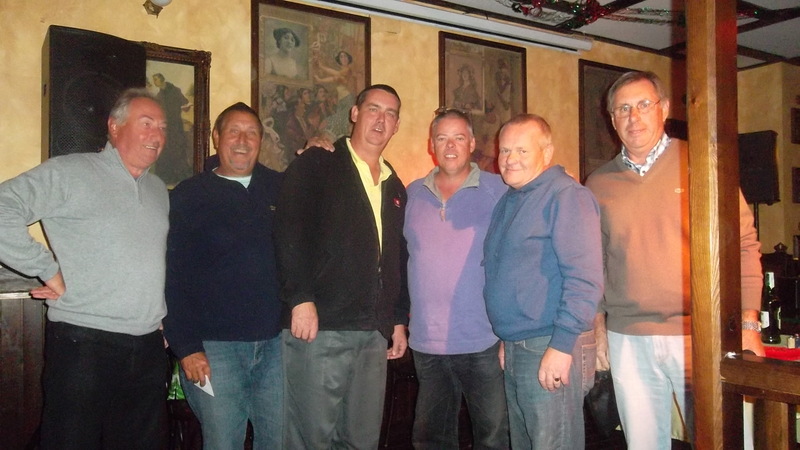 The anniversary trophy will take place on Friday February 7th, with the evening presentation being in the Condado Club, with a Neil Diamond tribute show. early morning frost is common now we are into the depths of a Spanish winter………. This week was a low entry for the team event (35 players), with a split in the starting times, meaning half the field set off 90 minutes after the rest. This was a result of the IRM members offer introduced a couple of months ago. It was then stated that members would not have to pay the 8 euro green fee in the quiet months of December, January, June, July and August. At face value it seemed a great benefit, but in actual operation it hasn’t worked out that way. Our initial understanding was that this only applied to roll up deals, so you could not pre-book. As this was the first week our course members had tried to use the benefit they initially booked times within the society block, but then cancelled Thursday intending to turn up and play on any spare time available. We are now told that cancellations must be made 48 hours before which has never been in our agreement. On arrival at the course Friday morning they were told that they could not play on the vacant slots left within society times. Although no one had booked these times they were told that they could only get the benefit OUTSIDE the reserved society block of times which were pre-booked months ago. So hence the split within the society competition. It is understandable that the IRM members want to play for nothing as it would be a significant saving over 5 months, especially for husband and wife memberships. But a knock on effect of this is that a divide will be created within the society with basically 2 distinct divisions. If IRM members don’t pay the 8 euros green fee they must play outside our times, which non members will not do as they would then lose their hard fought right to reduced green fees. The result will be that team events will be divided into IRM members and society members. This was not what the society was set up for, not create a divide. It seems that IRM are making it as difficult as possible to claim this attractive benefit. It is not a bonus to existing members but a tool to attract new ones. I don’t know what the answer will be, but this attempt by IRM to attract new members has fallen flat on its face, with expiring members stating they will not renew. It seems that the offer has many conditions not made clear when the deal was introduced. I just hope common sense prevails and this mess can be sorted out quickly. Anyway, back to the golf. 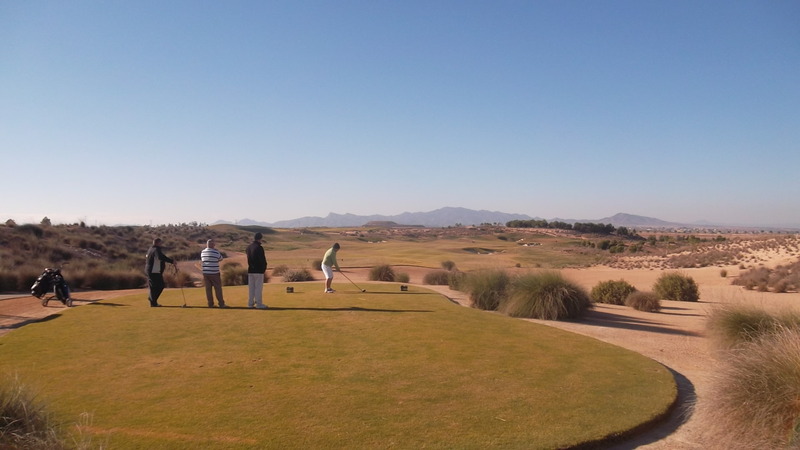 8 teams took part in beautiful sunny weather, with no wind of any significance to spoil the golf. 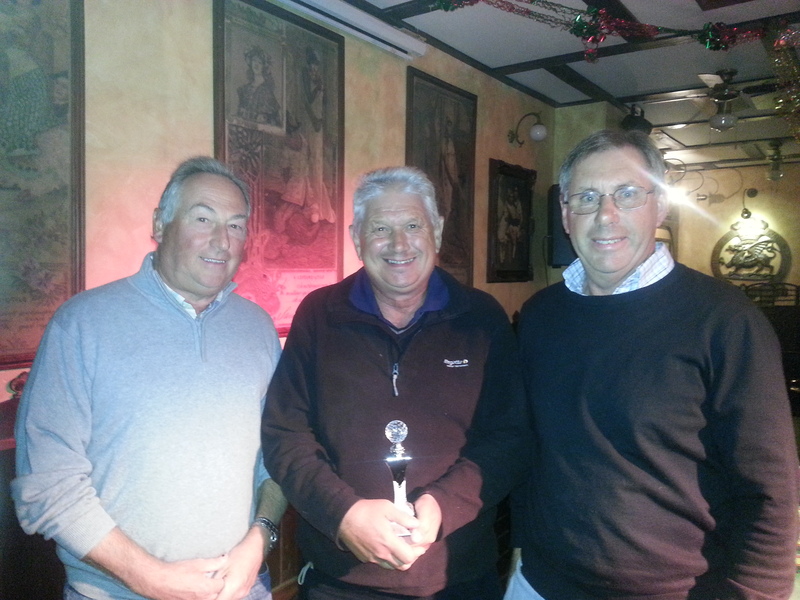 Next week is the Apollo Air individual stableford, and following that is xmas week. 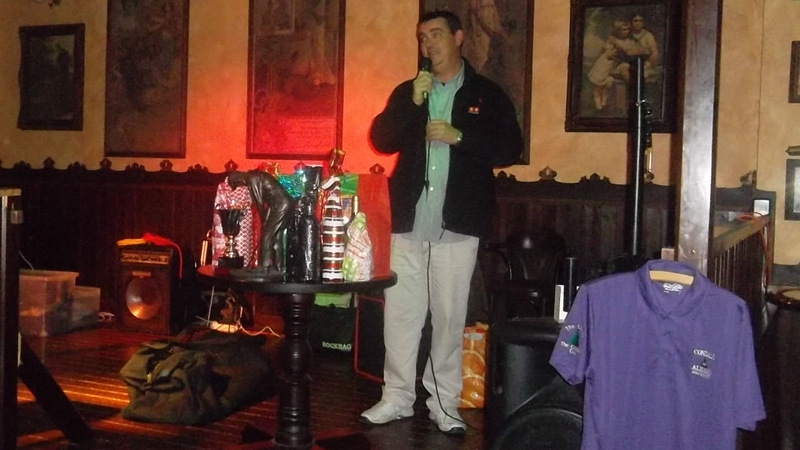 This will be an individual event – each player should bring a wrapped bottle (alcoholic) so everyone will get a prize. Off at last! A cold start to the round………. Early morning frost caused a 75 minute delay, with the 1st fourball having to wait until 10.15. Cold early on, but the 28 players soon started to shed their layers of clothing once out of the cold wind. The strokeplay format did affect scoring, with only one player beating par. Next week is a 4 person team event with 3 scores to count on all holes. Also as the fairways are now taking on their brown winter colour we are reintroducing preferred lies on fairways until spring.